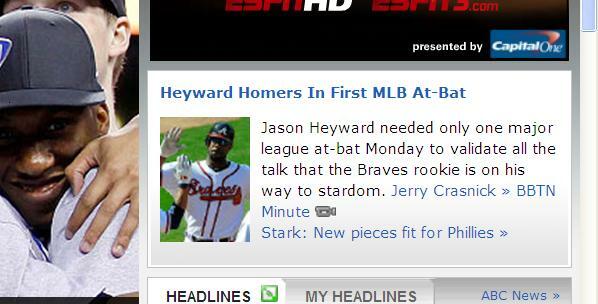 For the big print readers out there, it says: Jason Heyward needed only one major league at-bat Monday to validate all the talk that the Braves rookie is on his way to stardom. If you were too busy counting the money you were going to win from predicting the Butler-Duke championship, Heyward homered in his first major league at-bat. This is a rare feat accomplished by other famous sluggers such as Adam Wainwright. Placido Polanco establishes himself as the Phillies’ best hitter. Josh Johnson shows why the Marlins shouldn’t spend money on their players. Can any team get Albert Pujols out more than once a game? Joe Mauer thanks Minnesota for his $184 million dollar contract with 1-4 night, loss. Will the Dodgers lose every game this season?